MELROSE — The Gately family and staff sadly announce Tucker Gately has passed away. 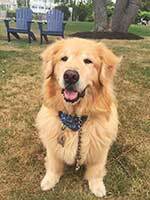 Tucker worked as a grief therapy dog at the Gately Funeral Home for over 11 years. He provided comfort to countless grieving people over that time. He was often found just inside the lobby of the funeral home greeting families and their visitors with a warm, happy face. When Tucker was about 2-3 years old he started going to work, never formally trained. The Gately family quickly realized he had the temperament and natural ability to connect with people and was always sensing the person in the room who was most in need of his comfort. As he began to meet more families his service grew very popular and requests were being made for Tucker to be there for the wakes and sometimes funerals. He was a particular favorite for the younger grandchildren coming in and could be found with groups gathered around him petting him on the floor while making the experience of being at the funeral home a little more tolerable. He had daily visits from people just walking by who wanted to stop and say “hi” and thank him for getting them through a hard time. He also had many followers on his Facebook page that enjoyed seeing him outside of work taking a swim, hanging out of the car window and relaxing on his front lawn. The Gately’s have been told many times throughout the years that a family bought a dog after their children met Tucker and couldn’t stop thinking and talking about him. Tucker had a larger than life personality and was a huge presence at home and at work and will be sorely missed by many. Two years ago, another dog joined him at the office, his “cousin” Mogul, a Burmese Mountain dog, who had been following Tucker around and learning the ropes. The Gately family would like to thank everyone for the hundreds of notes of sympathy and condolences on his Facebook page, it was a beautiful tribute to such a special friend.